Just as Mint.com greatly simplified people's ability to get their entire financial picture in one page, complete with trends, potential savings, and the option to see how they measured up to people across the country, Credit Karma brings the same level of transparency to one of the more opaque statistics out there - the personal credit score. And, unlike other gimmicky "free credit report" businesses out there, this one has its Karma in the good column, for it truly is free. One's credit score can impact a person's ability to make purchases with debt, or to achieve a desired interest rate. But the factors that can impact one's score are often seen as something of a black box. 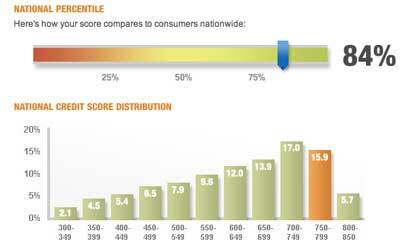 Consumers know that it is good to not have late payments, and that having some amount of open credit lines available is better than none, but how one goes up and down the credit score scale can be mysterious. This confusion has given rise to multiple "credit report" businesses like FreeCreditReport.com and FreeScore.com. Even the FTC has a dedicated site to the practice, discussing annual credit reports. (See their dedicated site or the official annualcreditreport.com for more) Most of the time, users find they may get an initial score free, and start receiving bills in later months, which can often be hard to cancel. I dealt with this myself, and was pleased to see Credit Karma skip that annoyance. When you sign up for Credit Karma, it is important they determine it's really you. Answer a few questions about your housing history, who may own your mortgage, or your car payment, and enter your social security number (just once), and they will hit up TransUnion for your score. But the fun doesn't end when you get your three-digit number. The number (mine came in at 767) is just the beginning, not the end result. Credit Karma lets you know how your score places you against your peers by age, by e-mail account domain, or how that compares to the national average. Much has been made about the fact that Yahoo.com e-mail holders have the lowest credit scores on average, so if you want to look great against your supposed peers, then use one of those free e-mail accounts. Could be fun. Beyond the sizing up, Credit Karma shows you how you got your score. I scored very well on percent of on-time payments with 100%. It's how I was raised, I guess. But I got D's on the age of open credit lines (thanks to the recent purchases of a home and minivan, no doubt) and total number of accounts. Turns out if I had twice the number of open accounts, I would have scored better. Go figure. I also got a C for my 4 "Hard Credit Inquiries". I Pay On Time! That's Good, Right? As with many things financial, you can have a disconnect between what you feel is good practice and what others say is actually great use of your credit. Keeping a small number of credit cards and paying off each month sounds great, but a full third of Credit Karma users have more than 20 credit accounts on file (open or closed). 60 percent of users have an average age of credit lines of less than 4 years, with only 10 percent having more than 8 years. Also like Mint.com, Credit Karma lays on potential savings thick. I have offers to reduce my credit card costs, my mortgage costs, auto loan costs or even bank costs. I haven't yet looked into any of them, and to be honest, probably won't, as these accounts are pretty new with the recent move and upgrades, so I'm a little fatigued by playing financial Tetris. But I am glad Credit Karma is out there to keep tabs for these options on my behalf. The site is free and open for business at http://www.creditkarma.com.